Total floor area: 12,470 sq.m. Built-in premises area: 933 sq.m. The business-class apartment building the «Building in Detskaya Street» is named after Detskaya street, which is considered to be the historical heritage of Vasilyevskiy island. Vasilyevskiy island is a special place for such a prestigious newly built housing in the city. Numerous well-known sculptors and architects worked on the island for more than three centuries and managed to create this district of historic buildings which survived almost unchanged. The building is situated to the west part of the Vasilyevsky island between Sredny and Bolshoy avenues, in about 10 minutes drive from the underground stations «Primorskaya» and «Vasileostrovskaya». The modern art museum «Erarta», the exhibition «Lenexpo», «Baltiysky» mall and passenger ship terminal are within easy reach of the house. 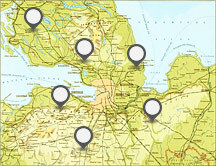 There are schools, kinder gardens, shops, hospitals, pharmacies, a number of known universities not far from the place. The municipal hospital «Pokrovskaya» is in the immediate neighbourhood as well. 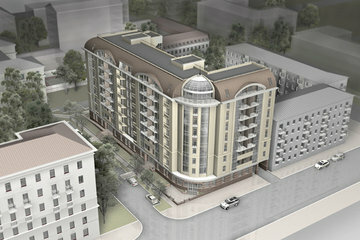 The «Building in Detskaya Street» residential complex is represented by a building with two main entrances designed individually according to the classic architecture concept. This principle creates the atmosphere of comfortable habitation and decorates the surrounding by its unique exterior. The construction is enlightened by aluminium stained-glass panels of the corner windows that open the halls, as well as by yard-side transparent balconies and stanzas and airy-looking dome. The building faces Detskaya street only with its side facade. For this reason the main space and volume design gimmick of the construction is the curved corner part with accentuated vertical sitting-room and kitchen corner windows coming together at the cornice level and finished by the glass dome segment. The ground floor has rustic veneer of natural stone. The upper floor is accomplished in the architectural composition of attic with semicircle roofing at 4 m height, panoramic glass windows that open amazing view. Each apartment of the house is spacious and light due to high ceilings (3 m for the lower floors and 4 m for the upper floors). Each apartment is provided with a balcony or stanza. The design of the interior space presupposed zone-division, opportunity to combine rooms and apartments and creation of an individual project. In common, the apartments might be characterized as light, spacious and comfortable places for living. The external wall sides are winterized for heat-saving purposes by 150 mm layer of «Rockwool FACADE BUTTS» material. The possibility of effective energy-saving and indoor microclimate maintenance is also ensured by the individual heat substation and facilities, specially selected according to the building scopes. The technology of combining brick and solid-cast building of this project is vastly presented in Europe and U.S.A. countries and is considered to become one of the most sophisticated modern technologies, guaranteed by decades of practice. This principle ecologically is not only safe and robust, but also it presupposes flexibility in interior design and planning, as well as unique architectural models. Stairs and elevators include high-quality goods-passenger lifts by German LEA. LEA elevators are prominent for their quality, smoothness of movement and noiselessness, as well as long-life service. Modern engineering systems of the building guarantee the habitants comfort. Parking is available from each floor of the building. Apart from fixed parking places, the garage is equipped with the double-layer automatic parking Combilift by Wöhr company, the worldwide leading producer of mechanical parking systems. Combined lifting systems allow horizontal and vertical automobile transportation. In general, the «Building in Detskaya Street» is the first complex in Saint-Petersburg that represents the example of construction equipped by a parking system adapted to the particularities of the Russian driving needs, thus user-friendly and safe. The facade of the building is easily viewed from Bolshoy avenue, which is the main traffic artery of Vasilyevskiy island. For this reason, commercial benefits of prospective placement utilization are vivid; banks, individual entrepreneurs, mobile network operators, medical institutions, beauty salons etc. exploit its advantageous characteristics, while the habitants of the building do not meet the inconveniences, because the building is designed taking into consideration the privacy of the visitors. The landscaped closed territory of the top-notch complex is protected 24 hours by both video recording and security service. The maintenance of the complex is under the supervision of the proprietary company. The landscape of yard area is represented by green space, grass mixture with the vegetable soils.